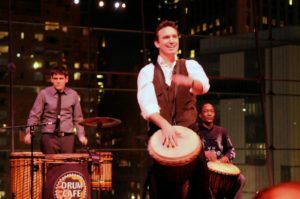 At the beginning of a Drum Cafe session, participants are invited to “pick up their drums and PLAY with us”. It’s this sense of play that opens us up to possibility, shifting our focus from being “result oriented”, to one that is more embracing of the process. It’s in the realm of PLAYing that discovery and innovation happen. As adults we need structure or some apparatus to help us be as “free” as we were as a child. If you’ve ever watched children playing “make believe” or “dress up”, you won’t see a lot of discussion of “how do we do this?”” what are we hoping to accomplish?” or even concern over how the story ends, they just fearlessly jump right in; “I get to be the Pirate, I’m the Starship Captain, I’m FishMan… “, And they’re off. As Adults, how do we get to that place, a place where we’re open to the creative process, but not stymied by our need for results? One possibility is by embracing the concept of “YES AND”, one of the central tenets of improvisational theater, or a musical jam session. The essence of this approach being that whatever you’re given by, or you receive from, a fellow collaborator, you accept with an implicit YES, and then move the creative effort forward with your own offering of “AND”. This YES AND concept, frees up participants to be more fully in the moment, without the distraction of results. By taking the focus off ourselves, and opening up to what others have to offer, it makes for a much more ego-free experience. With a strong connection to others and egos on the sidelines, fear and trepidation take a backseat to generosity and a palpable sense of possibility.